Roads and railways split the landscape and constitute barriers for many species. Traffic is an immediate danger for animals trying to cross the roadway, but the traffic barrier may also have more long-term ecological consequences for populations. Roads and railroads are both migration barriers and death traps for many, perhaps most, terrestrial animals. Barrier effects and traffic mortality are well documented, but it is still unclear how the impacts links to population effects looks, and where thresholds for action can be set. The impacts are obstacles to the development of a sustainable transport system and hence to fulfilling environmental goals. Swedish infrastructure planning has begun developing goals and metrics for the adaptation to landscape and wildlife, but many questions remain to be answered. 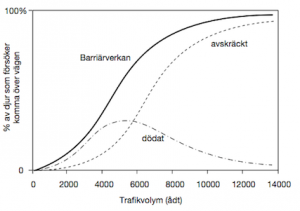 Due to the relatively low traffic and the relatively sparse infrastructure network in Sweden compared to much of Western Europe, however, the ecological problems in Sweden probably remain limited. This offers us a development advantage over other countries in Europe, where the transport sector already represents a threat to several species. We can work more proactively and goal oriented, and thus set an example for countries where a strong expansion of the transport network threatens biodiversity (eg Eastern Europe). However, goal orientation requires that the objectives of the landscape and landscape connectivity are formulated, made tangible, and translated into action plans. This requires development of tools, policies, measures and criteria preferably based on empirical knowledge of dose–effect relationships. TRIEKOL has helped developing some of these building blocks, and developed practical tools that the transport administration can implement in their conservation efforts. Based on the barrier effect and traffic mortality, we have developed criteria for thresholds/benchmarks, developed assessment and planning tools, and proposed goals to govern the assessment of action needs. Large mammals were used as a primary model species. This was because i) the landscape utilization of larger mammals matches the spatial scale on which the infrastructure is planned, ii) they are particularly demanding in terms of design and dimensions of mitigation measures such as fauna passages, iii) knowledge of these species are good, and the effects can be studied and quantified effectively, and iv) several other interests interact specifically on larger mammals. 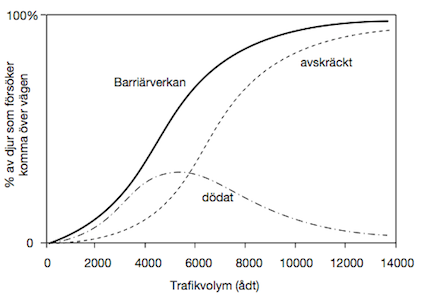 Above is a model on the relationship between traffic volume and the barrier effect of traffic on wildlife, based on empirical accident data for unfenced roads. Notice the unimodal effect of traffic on accident numbers, suggesting a behavioral response i.e. avoidance of busy highways. How big is the infrastructure barrier impacts on wildlife? Where and when is action needed? What mitigation measures should be selected and where should they be implemented?